Fun. Exciting. Hard to put down. Those are the words I would use to describe the first book in the Collector series, City in Embers by author Stacey Marie Brown. Follow the story of Zoey Daniels, a young woman who hasn't exactly had the easiest of beginnings. Switched from foster home to foster home from the time she was very young, she had to grow up quickly and develop a hard exterior in order to survive. At her last placement, one billed 'a last chance,' she finally let her guard down and built a true relationship with her foster sister, Lexi, a girl who is paralyzed and needs to use a wheelchair. The only other person in her life that has a true relationship with her is Daniel, the man she met after she joined a special government agency after high school, the Department of Molecular Genetics (DMG), and has fallen in love with. Lexi has a special gift, the ability to see fae. It's that gift that has led her to the DMG and her job as a Collector, a person who is charged with catching and using fae to protect human lives. But when she's connected to a fae Wanderer named Ryker, everything in her world changes and in order to protect herself, those she loves, and humankind in general, she may need to rethink what she's always accepted as true. Author Stacey Marie Brown has done a wonderful job of creating a fantastic book that you absolutely will not want to put down once you start reading it. The characters she has developed are so realistic that you will feel as if you know them personally. She's a master at world creation and at moving the storyline forward in a thrilling and suspenseful manner. 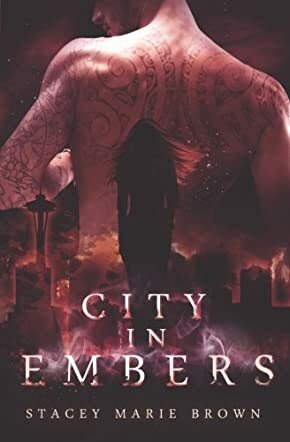 City in Embers is a book that will be enjoyed by any reader who loves an excellent book in the fantasy genre. I highly recommend this book, and I am very much looking forward to reading the next installment in the Collector series as soon as I can.